I'm trying to create the .gxl file for the Translator edition, so for our deployed application. We have one root directory with most files and then a subdirectory for modules. When building satellite assemblies for localization, the dlls for the projects within the root directory are correctly moved to a subfolder for localization (e.g. '/de/'), but the dlls for the projects within the 'Module' folder are placed in a new subfolder ('/Module/de/') and not in the root folder ('/de/'). I tried specifying this in the settings for the project, but it seems this 'Deploy Directory' setting is not being used by Globalizer. The Deploy Directory is set correctly in my .gxl file/root project to .....\Program Files\Application. 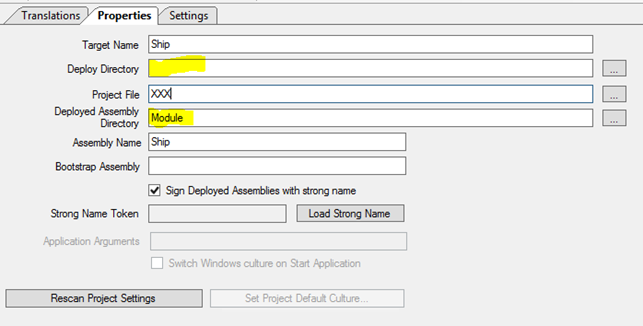 Leave the "Deployed Assembly File" blank (this is really only needed for ASP.NET projects) and instead set just the "Deploy Directory"